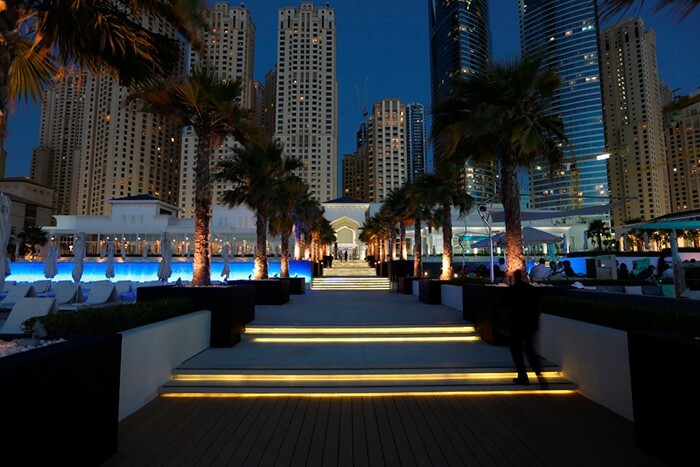 A Turbosound Aspect loudspeaker system has been installed at the Café Del Mar in Meydan Beach, Dubai by audio designer Joe Chidiac of Pulse Middle East, creating a focused, high energy dance floor sound field. Chidiac was invited to design the entire audio, lighting and rigging system based on the solid reputation he has built up in the UAE region, and by the high profile of his stunning audio-visual and lighting design at the Diablo nightclub project in Dubai, which is owned and operated by local celebrity DJ Cowboy. Buoyed by the success of Diablo and the confidence he places in the technical support of the award-winning UK loudspeaker brand, Chidiac decided on a four-point configuration of Turbosound Aspect TA-500 three-way point-source loudspeakers to provide high level, low distortion sound quality where it really matters. As the Café Del Mar venue is within the boundaries of Meydan Beach’s up-market Jumeirah Beach Residence, a major consideration of the project design was to minimise sound spillage into the nearby residential areas. "The entire venue could have easily been covered by two small line arrays," says Chidiac, "but as the DJ booth is facing the residential buildings it became clear that line arrays wouldn’t be sufficient in this case because I realised that potentially a lot of uncontrollable sound could be generated and directed toward the residences. We also had to take into account the wind speed and direction, which can be unpredictable." "One solution was to enclose the audio system in order to try to keep the sound within the venue, but that was not ideal. So I looked to Turbosound’s Aspect point-source loudspeaker systems for a better solution. The TA-500 series was the best choice for this venue as the 50° horizontal by 25° vertical dispersion is conveniently focused, and once you step out of the speakers’ hot zone and off the platform the sound level drops by around 10dB — a very useful noise reduction which made the operation easier by keeping the sound from reaching the residential buildings." The three-way TA-500s proved to be up to the task of achieving that goal, capable of outputting up to 141dB peak SPL, and were arranged in a four-point configuration that concentrates very high definition audio on the beachside dance floor. Under each TA-500 a B-18 neodymium driver bandpass subwoofer from the NuQ series delivers low end punch down to 40Hz. Additionally the club is equipped with a further eight TA-500 plus B-18 delay combinations, providing a balanced sound and completing a surround four-way system all over the venue. The system is designed as only one zone with the purpose of keeping the sound equally distributed everywhere. The loudspeakers were specially treated to IP67 at the factory to withstand all possible weather conditions that can occur at the beach and in any season. Turbosound RACKDP-50 four-channel amplifiers with built-in DSP power the whole audio system. "The DSP-enabled amplifiers provided a simple and speedy solution for programming and tuning the audio system," says Chidiac. "The factory-loaded system pre-sets required only minimal tweaking at some frequencies. "The project was completed in record time, taking only 12 hours to install and configure the entire system including the lighting and rigging," he says. "It was really impressive for a large system like this to be installed in such a short period of time." So concludes another successful project for audio specialist Joe Chidiac, lighting designer Rami Haber, and the Pulse Middle East engineering Team. "It has been a great experience with Turbosound," says Café Del Mar’s owner Mr. Umesh Amarnani. "I was very pleased with the short delivery lead time, product quality, and support." The audio system included 12 TA-500 wide dispersion mid/highs, 12 B-18 single 18" bandpass subwoofers and nine RACKDP-50 amplifiers.